Parents often ask me how we prepared our first child, who is now 2 and a half, for the arrival of our daughter, who is now almost two months old. This is a hot topic, as it is a challenge that every family of two or more faces. Before the new baby is born, buy a doll (or human-looking toy if you don’t like dolls) for your first child. Call the doll “little sister” or “little brother” and explain to your child that soon a little sister or little brother will be arriving, and that he can use the doll to practice how he will play with the baby or help take care of the baby once it arrives. 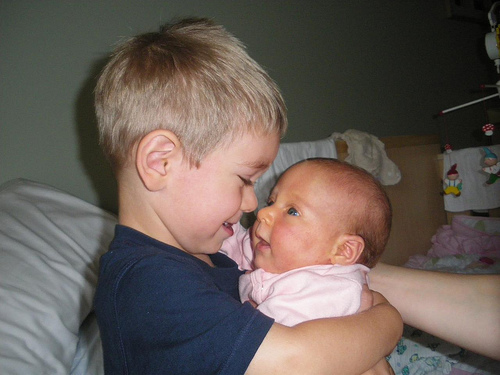 This gets him used to the idea of having a little bro/sis around, and provides an opportunity to start teaching him that he has to be gentle with the little baby. If your child does not already sleep in her own bed, now is a good time to start getting her into a bed (a full size bed is best – I’ll explain why later). I say this based on our experience and from talking to other dads. Before our daughter was born, our son still came to our bed at night from time to time, although he had his own bed. Now, if he wakes up at night, we try to still have him stay in his own bed. This is because our baby daughter is in our room, and if she wakes up at night, she would wake him up too. This would lead to him being tired and cranky the next day, which is something we definitely do not want! So if you will have your baby in your room, and your first child is still in your room, now is the time to try to switch it up. Think about getting a full size bed for your first child. This is related to my point above. If your first child wakes up at night (our son started waking up more often after our daughter was born), and you need to go to comfort him, it will be more comfortable for you to do so in a bigger bed. I spoke to one dad who got a queen-size bed for their first daughter for this reason. “Smart thinking!” is what I thought! Even though the bed might fill up the child’s whole room, it is called a bed-room, right? Around the time you (meaning, your wife) are expecting to give birth, get a gift for your first child that is “from the baby.” This will help your first child to feel more like the baby is her friend. Lets face it, most children are around the age of 1-4 when their younger sibling is born. At that age, right or wrong, kids love getting new toys and tend to like the people who give them the toys. So, a gift from the baby will increase the chances that your first child will take kindly to the baby. Keep reinforcing the fact that the gift is from the baby. This gift is also helpful because if it is really something your child enjoys, it gives him something to do while you are looking after the baby. We got our son a marble run from our newborn daughter, and he still loves playing with it. Get some books about being a big brother or big sister and read them to your first child. This one is kind of a no-brainer. It reinforces all the usual ideas about being an older sibling, being proud about it, looking after the baby and being gentle with it, etc etc. Get a T-shirt that says “Big Brother” or “Big Sister” on it (not for you, for your child – if you are interested in T-shirts for you, check here ). This will help to make your child proud of the fact that he/she is a big brother/sister. It can also help him/her to get into the role a bit more. It will also give you a chance to wash your child’s other favorite t-shirt. When your newborn arrives, take time to reinforce your love for your first child. This can be a challenge, because a newborn is so time consuming, but it is the most important thing you can do. Do your best to spend some good quality one-on-one time with your first child every day. With the right preparation and the right amount of time taken to tend to your first child, you can make this transition a smoother one. It is a big change for your first child to go through, so you can expect some bumps along the way. I hope you enjoyed these tips and that they help to make those bumps fewer and further between….especially if you don’t have shock absorbers. By the way, you can find more great thoughts and tips on this topic at another great fatherhood blog… check it out on Building Camelot’s “Bringing Home a Second Baby” post. If you have any ideas or would like to share what you have done to ease this transition for your child, please join the jam and share your comments here! Peace! When my oldest was 23 months old he got a new brother. I had a c-section so I was gone for 5 days. First time away from my oldest. He was mad at me when he came to visit at the hospital on day 2. He wouldn’t even hug me. The day I came home, I carried a big yellow tonka truck and daddy carried in the new baby brother. Reason: dad who was home as usual brought the new baby in and mom brings a special gift for the new big brother. Oldest was happy to see me and not hurt because I was gone. I got my big hug and kisses. He didn’t like the taste and there was no jealous about me feeding baby brother. He didn’t think he was being excluded. Thanks Laurie, great idea that you carried the special gift, I am sure that spoke volumes to you child. I like the nursing idea too! We were a bit surprised that our oldest, also a boy, didn’t want to try nursing again. Good that you let him try though, I think that was a good way to handle it! I really like the idea of giving your first child a gift from the baby. We went the opposite route and had Olivia pick out something for Madelyn. Thanks Tyler, sure, happy to link it up!